Emergency Lighting – You’re more likely to encounter a power outage now than ever before. With the increase and severity of natural disasters, it’s time to be prepared. Emergency lighting is essential along with an Weather Emergency Radio. And technology is making smaller and more efficient lighting options which don’t rely on costly disposable batteries to operate. The new emergency lights on the market are easy to store and practical to use. After reading hundreds of Amazon reviews, these are the best emergency lights. The Luci Inflatable Solar Light is one of the best options when it comes to emergency lighting. It’s an extremely durable solar LED lantern that only requires sun to operate. With seven hours in the sun, the Luci will stay lit for twelve hours on a single charge. The Luci is collapsible, lightweight (4.4 ounces), and entirely waterproof with an IP67 rating. It’s an extremely versatile light that can help you get through hours of darkness. It can also serve as a camping, patio, or barbeque light. It comes with 10 powerful white LEDs that shine in three different settings: bright, super bright, and flash mode. You’ll always know exactly how much charge is left in the light with the charge indicator so you know exactly when you’ll need a recharge. It comes with a one-year manufacturer’s warranty. This light offers everything you want in a lighting source. It provides up to 200 hours of light from one charge. This is practically unheard of and essential in an emergency. This is the light to have to prepare for hurricanes and tornadoes. There are low, medium and high light settings. Other features which make it great for emergencies are the SOS beacon light and the red hazard flashing features. Another awesome bonus is you can charge your cell phone with it. It charges with a rechargeable lithium ion battery (included). You can also charge it with a USB. What’s great is you won’t waste money on costly disposable batteries. Amazon reviewers loved bringing this light camping and hiking. It’s light and portable at just 1.3 pounds. You will want to use this light for a lot more than just emergencies. This compact solar camping lantern and flashlight isn’t only great for camping, hiking, and trekking, it’s great for use as an emergency light. It’s also an incredibly affordable option. The light has three lighting modes: high, low, and SOS. Let anyone know you’re in trouble with the SOS option as it will send out a lighting pattern that rescuers will recognize. You can charge the light with solar power or with the USB. One charge provides 10 hours of light. You can put multiple lights in your basement and one in your car for roadside emergencies too. Something special about this camping lantern is you can charge your phone in the USB port. This is a great feature to have as an emergency, when camping, etc. You wouldn’t want to rely on it to charge your phone from 0%, but it’s nice to keep it from dying out. We just love the solar feature of this light. You can leave it out during the day so you can use it each night. This headlamp comes with rechargeable batteries, a car charger, wall charger, and a USB cable. That makes for a plethora of recharge options when it comes to emergency lighting. With a lifespan of up to 100,000 hours, this headlamp will get you through multiple emergency situations. It has brightness capabilities of up to 1800 lumens. With a 3-in-1 multi-function capability, you can use this headlamp in a variety of ways. Depending on the situation, you can use the lamp on your head, around your waist, or set it on down to light a room. It’s zoomable, adjustable, and extremely durable. The lamp also has three different modes: low, mid, and strobe. This is a highly portable light source that you will likely find many uses for even outside of emergencies. It’s great to take camping, running, hiking and more. This compact flashlight will provide great lighting in an emergency. You can use the rechargable batteries or charge it with the USB. According to Amazon reviews, this is the flashlight of choice for military and law enforcement professionals. It will be great to take with you on camping trips. You can charge it up in your car. You will be surprised at how robust this flashlight is, and how light too… just 4.8 ounces. 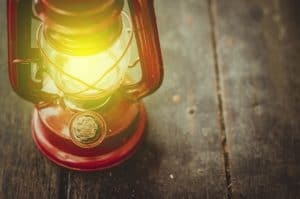 If the sun isn’t going to be coming around for some time to recharge your solar operated emergency lighting, then kick it old school with a propane lantern. This reliable option is a lamp that sits on top of a small propane tank. No power outage can take your propane away. This leaves you with a solid option for light. The Coleman Northstar Propane Lantern is a great choice. It will generate light for long periods of time, has adjustable brightness levels (up to 1543 lumens), and is easy to use. You will find multiple uses for this, not just for emergency preparedness. It’s sturdy, easy-to-use and practical to take camping. This Coleman propane lantern comes with a case which keeps it together, protected and organized. Note: Propane lanterns do require very specific sizes based on brand, so pre-purchase a supply of propane that will last you for weeks. These lamps can also come in handy during a winter power outage or summer storm. These emergency lighting lamps can be placed in your ceiling at heights of up to twelve meters. They have a futuristic design that offers a high degree of operational reliability and can distribute light throughout large rooms and corridors. The lights can light up stairwells and will guide you to safety. The minute the power goes out, these lights are designed to immediately switch to the battery powered built-in support system. You don’t have to forgo design in your business or home just to have emergency lighting options with the Serenga 2. It’s important to consider a backup power generator for outages as well. This light can serve as both an emergency light and a handy, powerful lantern for camping trips. It’s a portable LED lantern that requires batteries for use. A single bulb in the lantern provides up to 100,000 hours of light. The Parrotuncle is also adjustable for various lighting levels during your emergency. The Konig rechargeable light has 13 LED emitters and a built-in rechargeable lithium battery. Make sure the battery is always charged in case of an emergency, and this light can be an effective and efficient source of light during an outage. It provides 5 hours of continuous light. Power outages are inevitable, so have these go-to lights the next time you are without power. With high percentages of power outages happening, it’s important to be prepared for one. There are certain things you can do to prepare for a power outage. Buy several, and keep them in an easy-to-access cabinet or your emergency preparedness box so you will have them when you need them. The last thing you want to do is to have to rummage around for them in the dark. Emergency preparedness is a necessity. A healthy supply of food storage, as well as emergency lighting, is important for optimal preparedness. It’s very important to be prepared for a power outage. Having proper lighting will calm your animals during an emergency situation too. Having lighting is one of the most basic and easiest things to do. Unfortunately, natural disasters and epidemics are on the rise.